Washington’s Main Army retained its organization of three divisions and six brigades in January 1776. The average size of a brigade remained the same, although each now contained only four or five of the larger 1776 regiments. By early March, Henry Knox had accumulated enough heavy artillery to allow Washington to occupy dominant positions on Dorchester Heights, forcing the British to evacuate Boston. Washington correctly guessed that General Howe intended to attack New York and began sending units to that city on 14 March. The regiments went overland to Norwich, Connecticut, where they embarked and sailed the rest of the way along Long Island Sound. He opened his new headquarters at New York on 14 April, and the last of his units arrived three days later. The Main Army in New York now gained some of the new regiments from the middle colonies to compensate for the five left in Massachusetts. Shortly thereafter Washington had to transfer the equivalent of two brigades to the north. In April he regrouped his regiments under the one major general and four brigadier generals he had available for command assignments. Each of the four resulting brigades contained four or five regiments and defended a specific area or terrain feature; the artillery remained outside the brigade formations, although Washington placed the riflemen in the brigades manning the most advanced positions.41 These units formed the nucleus of the Continental forces that would defend New York in August against the onslaught of Howe. 39. JCC, 4:47, 186, 209-20; Smith, Letters of Delegates, 3:315-17, 336-37, 342-43, 350-51, 384-85, 387, 406, 440, 633-35; Fitzpatrick, Writings, 4:221-23, 374, 381-82. 40. Ward to Congress, 22 Mar 76, RG 360, National Archives; JCC, 4:300; 5:694; 6:931; Fitzpatrick, Writings, 4:467-70; 5:1-4; Burnett, Letters, 1:450-52, 505-6; C. Harvey Gardiner, ed., A Study in Dissent: The Warren-Gerry Correspondence, 1776-1792 (Carbondale: Southern Illinois University Press, 1968), pp. 16-19; Samuel Adams, The Writings of Samuel Adams, ed. Henry Alonzo Cushing, 4 vols. (New York: G. P. Putnam’s Sons, 1907), 3:290-91. 41. Fitzpatrick, Writings, 4:512-13, 535-36; 5:36-37. 42. Ibid., 3:379-80. Also see pp. 486-87. 43. R. I. Records, 7:376, 384-86, 403-4, 410, 415, 432-38, 492-93; Rhode Island Historical Society Collections, 6:141-42. 44. JCC, 4:311, 344-47, 355, 357, 360; Samuel Adams, Writings, 3:288-90; Burnett, Letters of Congress, 2:78-79; R. 1. Records, 7:537-38, 554, 599-600, 606-9; Rhode Island Historical Society Collections, 6:154-55, 160-63, 170-73. Smith, Letters of Delegates, 4:3-4, 31-33, 228-29. 45. Force, American Archives, 4th ser., 5:1272-74, 1288, 1296-97, 1312; 6:801-2; 5th ser., 1:3, 314, 404-5, 459-60; 2:805-6; 5th ser., 1:28-29, 48-49, 62-68, 991; 2:805-6; Conn. Records, 15:296-305, 416-17, 434, 485-87, 514-16; Fitzpatrick, Writings, 5:363, 463; Ward to Congress, 22 Nov 76, RG 360, National Archives. THE DECLARATION OF INDEPENDENCE. 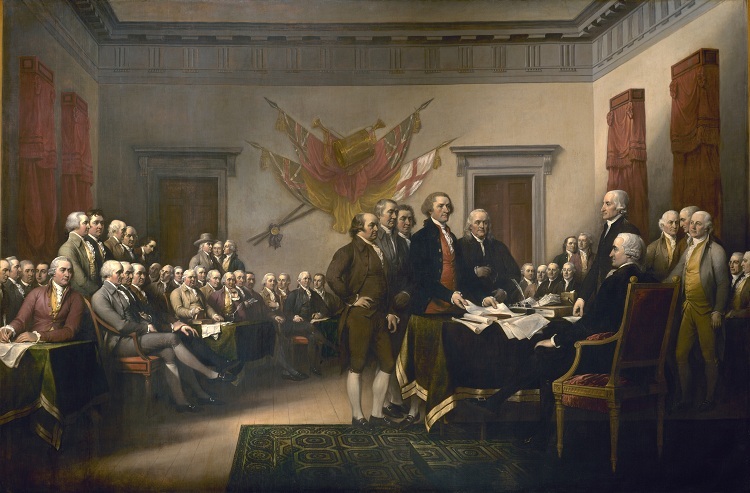 John Trumbull, a former Continental Army officer and son of Connecticut’s wartime governor, completed this masterpiece while studying art in London during the late 1780’s or early 1790’s. The colors of the 7th Regiment of Foot, captured at St. John’s in 1775, hang on the wall in the background. Congress’ decision to turn to the militia rather than attempt to recruit more Continental regiments was based on practical and ideological reasons. Militia could take to the field quicker. Many delegates also believed that America faced a crisis which demanded the full participation of society for the Revolution to succeed. They felt that the militia, rather than the regular army, was the military institution which represented the peopled All of the colonies from Maryland northward responded to this and subsequent calls for militia, although few furnished their full quotas. 46. JCC, 4:399-401, 410-14; Fitzpatrick, Writings, 5:56-58, 78n, 218-24. 47. Burnett, Letters, 1:492-94; Henderson, Party Politics, p. 104; White, “Standing Armies,” pp. 95-110; Cress, “The Standing Army, the Militia, and the New Republic,” pp. 134-38. In mid-September the Main Army’s fourteen infantry brigades contained 31,000 officers and men.50 Over 7,000 were sick, although most were not sufficiently ill to be hospitalized. Another 3,500 were on detached duties. Fifty-seven percent of the total strength came from 36 regiments of militia and 4 regiments of state troops. The 25 Continental regiments accounted for 674 officers, 103 staff officers, 602 sergeants, 314 drummers and fifers, and 11,590 rank and file. Only slightly more than half of the rank and file were carried as present and fit for duty: 3,153 were sick and 2,356 were “on command.” Nearly two-thirds of the total on special duties were continentals rather than militia, a significant indication that they had better training. The regiments were reasonably complete. Half were over three-quarters full, if one includes the sick and detailed personnel. The eight which fell below two-thirds all had special reasons for their status. The 1st Continental Regiment was in the process of reorganizing, and the others had suffered heavy casualties in the battle of Long Island several weeks earlier. These figures indicate that only a fraction of Washington’s large army consisted of trained, reliable troops. On the other hand, his regular regiments were reasonably close to their prescribed organization and had the potential for performing well in battle. It is also of some note that although the Main Army still drew the majority of its men from New England, units from as far south as Virginia were present. 48. Force, American Archives, 4th ser., 3:1819-20, 1828; 4:524, 1573-75; 6:961; 5th ser., 1:1317; 2:69, 80, 97; Pennsylvania Archives, 1st ser., 4:751-52, 780; 5:33; 8th ser., 8:7429-46, 7461-65. 49. Fitzpatrick, Writings, 5:379-81, 422-23, 501-3; 6:3-4, 207-8; Burnett, Letters, 2:45-57; JCC, 5:597, 641; 6:898. 50. General Return, Main Army, 14 Sep 76, RG 360, National Archives. This return does not include the Flying camp or various regiments such as the Delaware Regiment that were not physically with their brigades on that day. Lesser, Sinews, pp. 32-35, prints another return from 28 September. Comparable expansion took place in the areas of logistical and medical support. 51. JCC, 4:177, 187, 236, 311, 315; 5:419, 460; 6:933; 10:124; Force, American Archives, 4th ser., 6:1013-14; Fitzpatrick, Writings, 4:202-7, 223; Greene, Papers, 1:264-65; British Headquarters Papers, nos. 1894, 2443, 3320 (Charles Jenkinson to Henry Clinton, 5 Apr and 23 Nov 79 and 5 Feb 81). In 1776 reports required a ream of paper a month per regiment. 52. JCC, 4:311; 5:418, 613; Fitzpatrick, Writings, 4:287, 369, 381, 387-88; 5:50, 125, 165, 337-38, 481; Carlos E. Godfrey, Commander-in-Chief’s Guard: Revolutionary War (Washington: Stevenson-Smith, 1904), pp. 19, 35-38. In 1776 Washington also had an assistant secretary, Alexander Contee Harrison, and Congress appointed the French arms exporter Pierre Penet an honorary aide.